A functioning immune system is essential for survival, but even the sophisticated cellular and molecular defenses of the mammalian immune response can be defeated by pathogens at virtually every step. In the competition between immune protection and pathogen evasion, pathogens have the advantage of more rapid evolution because of their shorter generation time, large population sizes and often higher mutation rates. Thus pathogens have evolved a diverse array of immune escape mechanisms. For instance, Streptococcus pneumoniae (the bacterium that causes pneumonia and meningitis) surrounds itself with a capsule that inhibits phagocytes from engulfing it and displaying antigens to the adaptive immune system. Staphylococcus aureus (the bacterium that can cause skin infections, abscesses, and meningitis) synthesizes a toxin called leukocidin that kills phagocytes after they engulf the bacterium. Other pathogens can also hinder the adaptive immune system. 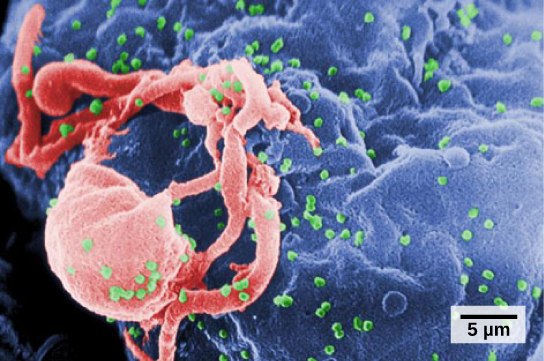 HIV infects TH cells using their CD4 surface molecules, gradually depleting the number of TH cells in the body (Figure 12.21); this inhibits the adaptive immune system’s capacity to generate sufficient responses to infection or tumors. As a result, HIV-infected individuals often suffer from infections that would not cause illness in people with healthy immune systems but which can cause devastating illness to immune-compromised individuals. A maladaptive immune response toward harmless foreign substances or self-antigens that occur after tissue sensitization is termed a hypersensitivity. Types of hypersensitivities include immediate, delayed, and autoimmune. A large proportion of the human population is affected by one or more types of hypersensitivity. The immune reaction that results from immediate hypersensitivities in which an antibody-mediated immune response occurs within minutes of exposure to a usually harmless antigen is called an allergy. In the United States, 20 percent of the population exhibits symptoms of allergy or asthma, whereas 55 percent test positive against one or more allergens. On initial exposure to a potential allergen, an allergic individual synthesizes antibodies through the typical process of APCs presenting processed antigen to TH cells that stimulate B cells to produce the antibodies. The antibody molecules interact with mast cells embedded in connective tissues. This process primes, or sensitizes, the tissue. 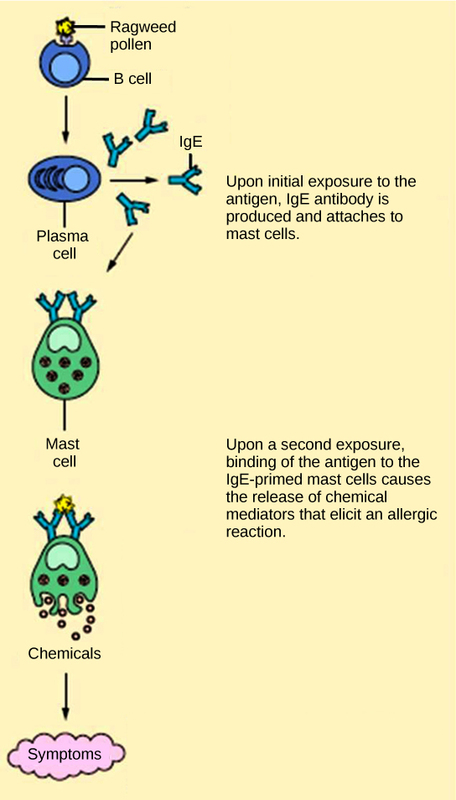 On subsequent exposure to the same allergen, antibody molecules on mast cells bind the antigen and stimulate the mast cell to release histamine and other inflammatory chemicals; these chemical mediators then recruit eosinophils (a type of white blood cell), which also appear to be adapted to responding to parasitic worms (Figure 12.22). Eosinophils release factors that enhance the inflammatory response and the secretions of mast cells. The effects of an allergic reaction range from mild symptoms like sneezing and itchy, watery eyes to more severe or even life-threatening reactions involving intensely itchy welts or hives, airway constriction with severe respiratory distress, and plummeting blood pressure caused by dilating blood vessels and fluid loss from the circulatory system. This extreme reaction, typically in response to an allergen introduced to the circulatory system, is known as anaphylactic shock. Antihistamines are an insufficient counter to anaphylactic shock and if not treated with epinephrine to counter the blood pressure and breathing effects, this condition can be fatal. Delayed hypersensitivity is a cell-mediated immune response that takes approximately one to two days after secondary exposure for a maximal reaction. This type of hypersensitivity involves the TH1 cytokine-mediated inflammatory response and may cause local tissue lesions or contact dermatitis (rash or skin irritation). Delayed hypersensitivity occurs in some individuals in response to contact with certain types of jewelry or cosmetics. Delayed hypersensitivity facilitates the immune response to poison ivy and is also the reason why the skin test for tuberculosis results in a small region of inflammation on individuals who were previously exposed to Mycobacterium tuberculosis, the organism that causes tuberculosis. Autoimmunity is a type of hypersensitivity to self-antigens that affects approximately five percent of the population. Most types of autoimmunity involve the humoral immune response. An antibody that inappropriately marks self-components as foreign is termed an autoantibody. In patients with myasthenia gravis, an autoimmune disease, muscle-cell receptors that induce contraction in response to acetylcholine are targeted by antibodies. The result is muscle weakness that may include marked difficultly with fine or gross motor functions. In systemic lupus erythematosus, a diffuse autoantibody response to the individual’s own DNA and proteins results in various systemic diseases (Figure 12.23). 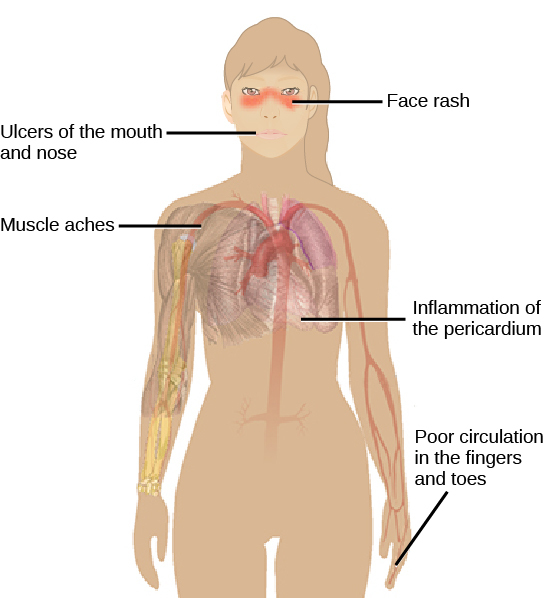 Systemic lupus erythematosus may affect the heart, joints, lungs, skin, kidneys, central nervous system, or other tissues, causing tissue damage through antibody binding, complement recruitment, lysis, and inflammation. Autoimmunity can develop with time and its causes may be rooted in molecular mimicry, a situation in which one molecule is similar enough in shape to another molecule that it binds the same immune receptors. Antibodies and T-cell receptors may bind self-antigens that are structurally similar to pathogen antigens. As an example, infection with Streptococcus pyogenes (the bacterium that causes strep throat) may generate antibodies or T cells that react with heart muscle, which has a similar structure to the surface of S. pyogenes. These antibodies can damage heart muscle with autoimmune attacks, leading to rheumatic fever. Insulin-dependent (Type 1) diabetes mellitus arises from a destructive inflammatory TH1 response against insulin-producing cells of the pancreas. Patients with this autoimmunity must be treated with regular insulin injections. Immune disruptions may involve insufficient immune responses or inappropriate immune responses. Immunodeficiency increases an individual’s susceptibility to infections and cancers. Hypersensitivities are misdirected responses either to harmless foreign particles, as in the case of allergies, or to the individual’s own tissues, as in the case of autoimmunity. Reactions to self-components may be the result of molecular mimicry. 12.4 Disruptions in the Immune System Copyright © by laesoph. All Rights Reserved.